October 31, 2011  Congress still bans women from serving in combat, but the U.S. Army has implemented Cultural Support Teams to foster dialogue between elite U.S. service women and Afghan women. The teams work closely with Rangers and Special Forces units during raids. Kevin Maurer recently wrote about the unit's purpose and tough selection process for The Washington Post Magazine. He speaks with host Michel Martin. 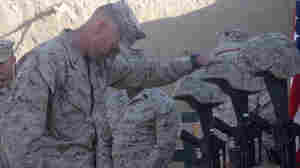 Lt. Col. Jason Morris pays his respects at a memorial service in Sangin, Afghanistan, on Nov. 26, 2010, for three Marines who were killed: Lance Cpl. Brandon Pearson, Lance Cpl. Matthew Broehm and 1st Lt. Robert Kelly. 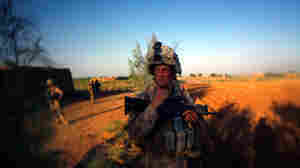 Morris commanded a battalion in volatile Helmand province that suffered the highest casualty rate of any Marine unit in the Afghanistan War. October 30, 2011  In Afghanistan, Lt. Col. Jason Morris led the 3rd Battalion, 5th Regiment, which suffered the highest casualty rate of any Marine unit during the past 10 years of war. The "Darkhorse Battalion" commander says the unit's mission was a success — but he will live with the burden of those deaths. October 24, 2011  President Obama announced Friday that all U.S. troops will be out of Iraq by the end of 2011. Since the Iraq War began in 2003, more than 1.5 million Americans served and more than 44 hundred died. Michel Martin explores if service members see the drawdown as a victory, how the mission in Iraq has evolved and what lessons can be drawn from it. Martin speaks with Ed Dorn, former Undersecretary of Defense for Personnel and Readiness, and Leo Shane, a reporter for the independent military newspaper Stars & Stripes. 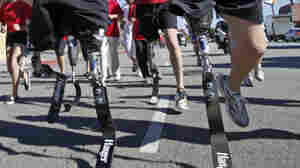 Military members who lost their limbs overseas participate in a run in California. October 13, 2011  More soldiers are returning from Iraq and Afghanistan with wounds that would have been fatal a decade ago. The injuries have led to advances in combat medicine but have challenged the health care systems meant to help veterans back home. War reporter David Wood talks with Fresh Air about the hurdles facing these troops and their families. October 10, 2011  It's a rare time in U.S. military history: During the longest period of sustained warfare, members of the military make up just one-half of 1 percent of the U.S. population. With fewer people sharing the burden, many veterans are having a difficult time adjusting to civilian life. Darryl St. George was a high school teacher on Long Island before becoming a Navy corpsman. 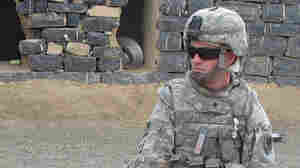 In June, he was serving in southern Afghanistan. He's back in the U.S. for the time being and has visited his former school. October 8, 2011  A year ago, Darryl St. George left his post as a teacher on Long Island to become a Navy corpsman stationed in Afghanistan. Back in the U.S. until his next tour, St. George went back to his school hoping students and former colleagues would understand why he left. October 1, 2011  More than 50 of America's most decorated war heroes are in Louisville, Kentucky, this weekend to celebrate the 150th anniversary of the Medal of Honor. Three men have received the honor in the last year — the first time the Congressional Medal of Honor Society has welcomed new living members since Vietnam. Reporter Brenna Angel of member station WUKY, reports on how they shared their stories across generations. 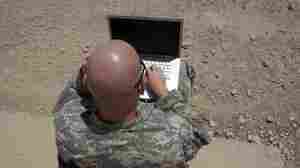 September 22, 2011  Many veterans say writing about war helps them confront the emotions they carry. The Missouri Warrior Writers Project is working to compile those service members' stories in the anthology Holding Each Elephant's Tail: Voices from the Iraq and Afghanistan Wars. September 22, 2011  The U.S. military faces a December 31 deadline to withdraw from Iraq. Many Americans argue that it is time for Iraq to stand on its own. But Meghan O'Sullivan, former deputy national security adviser to President George W. Bush, says the U.S. must maintain a strong force in Iraq. September 16, 2011  Hurling, the sport that was created by ancient Celtic warriors, has found a niche following among some soldiers in the U.S. A group of National Guardsmen in New Hampshire formed a team to stay in shape after Middle East deployments. But they found benefits much more than physical. September 10, 2011  Heather Courtney's documentary is part war story, part small-town homecoming saga. Where Soldiers Come From follows a group of young Michigan men who sign up for the National Guard and serve together in Afghanistan. September 9, 2011  Immediately after the Sept. 11 attacks, many first responders and other victims received psychological care. Ira Flatow and guests look at the psychological effects of 9/11, and what researchers have learned since then about caring for victims of psychological trauma. September 6, 2011  Nearly half of the women who've been deployed to Iraq and Afghanistan have been mothers. This week's parenting conversation explores issues of preparing kids for parents' deployments, how kids adjust to these changes, and how military mothers face different challenges than military fathers. Guest host Jacki Lyden hears from Sergeant Major Odetta Johnson of the U.S. Army Reserves; Margaret Pooley, whose son just returned from Afghanistan; and Laura Browder, author of When Janey Comes Marching Home.